Nature surrounds the historic hotel Bekkjarvik Gjestgiveri, which opened in the late 17th century. It was established in response to a 16th century decree that there should be a gjestgiveri, a guesthouse, built at every location within a full day’s journey to sea. At the heart of a fishing village, the Bekkjarvik Gjestgiveri earned its reputation as being one of Norway’s most acclaimed hotels and has been taking in guests for more than 300 years. At Bekkjarvik Gjestgiveri, the staff is focused on providing guests with the best reception and service. Located just off the beaten path, this 48-room hotel offers serenity and balconies or patios to enjoy the charming local landscape. 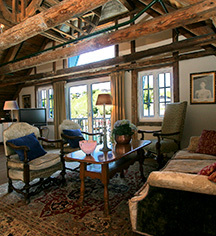 All guestrooms include a complimentary breakfast, as well as access to a fitness center, attached winery, and a boat dock. The hotel offers lovely scenery with the sea and its long history as a backdrop. Dining options include a restaurant and coffee shop. With an impressive outdoor terrace, the hotel serves meals seasonally to be enjoyed in the warmer months. Other guest services include a shared lounge, spa, and bicycle rentals. The Bekkjarvik Gjestgiveri is nestled in the small village of Bekkjarvik on Norway's western coast, situated in the Austevoll municipality in Hordaland County. Though small, the village of Bekkjarvik is filled with personality. This quiet locale is a wonderful escape from the hustle and bustle of the city. In addition to the hotel's recreational activities, guests can explore beyond on foot or by ferry. Some notable local attractions to explore include the Villa Lysøen, home to Norwegian violin-virtuoso Ole Bull, and the Kvalvåg marina. Bekkjarvik Gjestgiveri, a member of Historic Hotels Worldwide since 2018, dates back to the late 17th century. 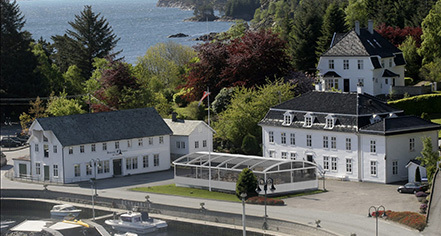 The Johannessen family has operated this historic hotel for over 30 years; and the twin brothers, Ørjan and Arnt, are the Chef and Kitchen Manager of the hotel restaurant. Cribs and Pack-n-Plays: Available upon request; surcharge. Extra Person Fees: Fees vary. Beds are available for NOK 500 per night. Hotel/Resort Fees & Taxes: A resort fee is included in the total price. Occupancy Restrictions: Varies by room type. The maximum number of extra beds in a room is one. Payment: Visa, MasterCard, American Express, Diners Club and cash are accepted. Pet Policy: Pets are allowed for an extra charge of NOK 150 per pet, per night, in specific rooms only. Pet-friendly rooms can be requested by contacting the property at the number on the booking confirmation. Nature surrounds the historic hotel Bekkjarvik Gjestgiveri, which opened in the late 17th century. It was established in response to a 16th century decree that there should be a gjestgiveri, a guesthouse, built at every location within a full day’s journey to sea. Learn more about the History of Bekkjarvik Gjestgiveri .